This chart is revealing the dynamics of enterprises now looking to execute on plans to reduce costs and drive change into their business operations after hunkering down during the recession. Applications and infrastructure: most larger firms have already been using IT services vendors to deliver work in outsourced contracts for some time now, hence the relative small percentage of customers starting ITO for the first time. The notable trend here is the sheer magnitude - over 50% - of firms intending to increase the scope of their existing IT outsourcing engagements. We're already seeing significant revenue growth from several of the ITO vendors over the last couple fo quarters, as they layer on work for customers. As we've discussed at length, there's still a lot of room for labor-arbitrage deals in the short-medium term, with 75% of ERP still being maintained and supported onshore. Hence 2010 will constitute something of a land-grab for the arbitrage work from the leading services vendors. The big question will be who wins the higher-value transformative work when the obvious arbitrage opportunities eventually dry up. Our take - IT outsourcing to peak this year.The delivery models for standard ITO services are mature and scalable enough to cope with the demand. 2010 will be a peak year for the ITO business as the services vendors rapidly mop-up the labor-arbitrage deals. The gauntlet really gets laid down towards the end of this year, as customers want to find new ways to drive productivity after the arbitrage is exploited, for example virtualization and cloud-based services. 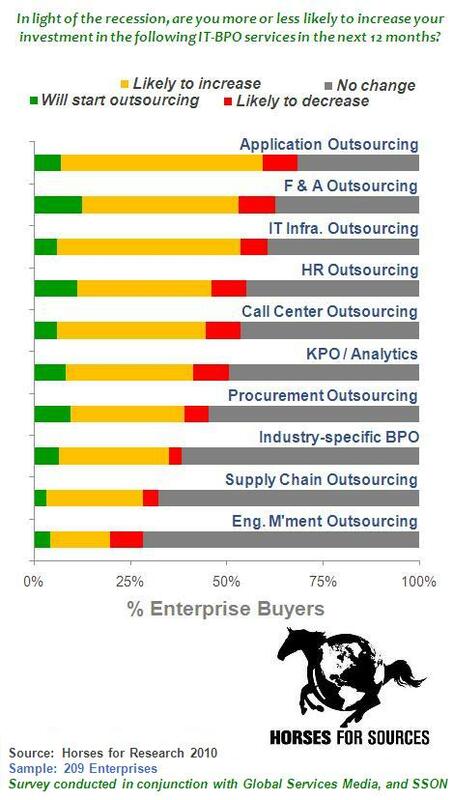 BPO: simply put, many BPO functions are a lot less developed, less scalable and less "productized" than those of IT outsourcing, so expect a lag-effect between the resurgence in ITO and a bounce-back in BPO engagements being signed. We'll delve deeper into the BPO dynamics, in the coming days, to discuss the development path of the process areas and their blend with IT delivery. However, similar to ITO, it's clear a lot of pent-up demand from business case evaluation in the recession months, will come into play in 2010. Transactional finance and accounting (F&A) outsourcing (i.e. payables and receivables) has become well-resourced and supported by a number of vendors, with over 70,000 delivery staff working for services vendors across the globe. One-in-six customers expect to venture into an F&A BPO engagement for the first time this year, but more significantly, 40% of them will be layering on additional F&A processes to existing engagements, with only a small fraction actually pulling back work. Much of this demand is coming from mid-market firms, so expect a multitude of smaller transactions in the $5m-$20m range being signed this year. In a similar vein, some HR outsourcing functions will be outsourced, with 11% expecting to outsource for the first time, and a third of customers adding additional scope. Unlike the multi-process HRO business of yesteryear, most of the new HRO engagements will be single-process in areas such as payroll, staffing (recruitment process outsourcing) and benefits administration, where vendors have established and more scalable delivery models, underpinned by technology platforms and a blend of onshore, nearshore and offshore delivery. Other areas of note, that will be discussed in further detail down the road, involve an uptake in call center work, to be expected during a period of some economic recovery, and a lot of firms exploring analytics / knowledge process outsourcing, especially among mid-market customers. Most interestingly, we're seeing a real interest from customers to explore industry-specific BPO models, most notably in the financial services and life sciences sectors. Our take - BPO to re-emerge, but demand will outstrip supply. Simply put, many firms that laid-off heavily during the recession are opting for more flexible support models as we move into an uncertain period of economic recovery. Outsourcing fits the bill in many cases, as it provides a more flexible, lower-cost option that can support uncertain business volumes. Moreover, outsourcing can provide a unique change opportunity for firms, as they look for better payroll systems, flexible recruitment support, a streamlined global accounts payable process flow etc. However, BPO areas usually necessitate more intricate business re-engineering and change management than those in IT support areas, and the cost-savings can be a lot less attractive in many instances. In addition, a lot of the fresh demand is coming from the mid-market, where the numbers of process staff involved are fewer, and the labor arbitrage savings less attractive than those of larger companies with greater scale. Not to mention the pressure on vendors to maintain their profit margins, which is going to make it tough for them to be as cost-competitive with mid-market deals as they are with higher-end pursuits. The bottom-line: outsourcing is back on the table, but the industry will only be able to respond initially to demand in commodity areas. It's encouraging for the outsourcing industry that customers are seriously looking at outsourcing to solve many of their performance issues, however, trying not to insert too much of a damp squib into this positive data, many services vendors are not geared to give them the cost-savings they hope for, in many instances. Not many customers will turn away opportunities to drive out 30%+ cost-savings and the chance to improve their support operations, hence the resurgence in demand after such a long period of careful planning. However, the industry has been geared to solving low-hanging fruit outsourcing opportunities, such as application support and standard transactional business processes, where the common denominator has been cost-reduction via high-scale labor arbitrage. While there is clearly a lot of new business to be taken on in this environment, the real issues are arising in the mid-market, where lesser-scale necessitates a vendor partner which can deliver more than low-cost staff in a scalable delivery model. The transformation many mid-market customers need to move into an outsourced environment, often requires new technology implementation that incorporate elements of SaaS and Cloud computing, deep domain-specific consultative support and a skilled change management program. While several services vendors have these capabilities today, they are scarce and come at a price. As a consequence, many of these customers will be disappointed at the level of immediate cost-savings on the table and will be challenged to create outsourcing business-case justifications to their leadership, in order to proceed. The challenge is on for services vendors to craft creative solutions for clients that provide more than merely standard delivery underpinned by labor-arbitrage. The winners will be those that can step up and craft creative, innovative offerings and convince their shareholders they are doing the right thing. Now with improvement in demand for outsourcing we have witnessed an increase in job-switching among the talent of the vendors for better prospects.Attrition has its own implications for the existing clients who experience dip in quality of resource. This may also be for another reason where vendor promises "A resources" to new account and bleed existing accounts. I believe vendors must put as much stress on delivery to existing outsourced relationships as they do on acquiring new accounts. There is another challenge and that is for the client to understand exactly what they want and how much of a challenge to their existing ways of thinking, they are prepared to accept. Too often in my experience, the vendor will be willing to craft creative solutions but the client will not want them to do so, despite stating so throughout the tendering process. And my background is as someone who has managed outsourced services from the client side. I have a very cynical answer from the perspective of a participant and an observer of this type of organizational change over a 32 year career. 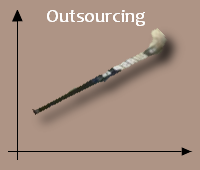 Outsourcing to insourcing, back to outsourcing, and back to insourcing. This is a cycle that occurs every 10 years or so. Real business cases can be made for either approach being more desirable, based on cost, experience, competitive advantage, positioning of corporate expenses, and core competencies. I have seen it over and over again. Couple of points and all of this is good food for thought. ITO will flatten unless buyer innovation increases. I would have said in 2009 that we were in stabilization mode. In 2010 it can continue or increase IF buyers start thinking about growing business rather than lamenting about the economic status. BPO the level of supply is hugh BUT their qualifications are substandard. Many lack core business competencies and are marginal at delivery. As a result of a frail state many will fail or be consumed by larger groups. In order to adequately meet demand all sector require supply side hardening. You hit the nail on the head in your final paragraph: "The winners will be those that can step up and craft creative, innovative offerings and convince their shareholders they are doing the right thing". Wall St does not care about anything beyond quarterly earnings, and does not understand that the current growth curve is short-term. If they generally understood how the services industry will evolve (Cloud, SaaS, innovation) they would help vendors be valued on their future earnings potential beyond winning labor arbitrage deals. @Jerry: agree re the hardening needed on the supply side. There needs to be a coming together of consultative skills and BPO delivery acumen to craft solutions that can address the challenge of many mid-market clients today. I think most vendors "get it", they are just fearful of breaking a successful revenue / profit model - i.e. "if it ain't broke, why fix it". I hang out hope that most services vendors are pretty good at "reacting" to client demand. When the demand for the easy stuff subsides, they will get more active with evaluating their M&A needs to respond to the market. Thought unit I - labor arbitrage delivery model has little to offer in an evolved market where we stand today. Saving cost is important but it's not the ultimate goal. Growth in topline is vital. Everybody is recognizing this. Thought unit II - How does an organization use its IT assets/ services/ ecosystem to significantly improve its topline? Its new emerging need and IT department in most of the organization haven't yet learnt the method for doing so. Thought unit III - thats what customer will expect from their IT service provider going forward. This suddenly brings IT in boardroom fand requires a strategic approach to deal with. Service providers who can evolve faster would sustain others will fall out. Phil: Any Vendor can dissappoint. A partnership is what you are looking for when insourcing, outsourcing, co-sourcing, nearshoring, or offshoring. Any type of sourcing, needs to be looked at to determine is it the right thing to do, does it make the best business sense, is there an ROI and what is the value add that the company, the customer, and the vendor partner receive to make this a successful venture. Too many vendors do what is being asked and do not bring the experience they have gained from the outside to truly present a solution that solves a problem or brings a value proposition to the table. If they do they try to take a cookie cutter approach to a solution and try to implement one that worked for customer A to customer B even though it is a completely different environment and culture. In order for Vendors to be successful and meet the demand they are going to need to "say no" some times. They need to focus on their strengths so that the customer can get the benefits of an expert not just a proposal that does it with little or no value add. It may take a customer a little more time to get processes in place to partner with a few firms that allow them to be successful instead of trying to get one or two firms that sell that they can do it all. Going from Labor Arbitrage to a value added solution takes investment from both the customer and the provider and with that partnership the demand can and will be met. There is a threshold within each vendor and within each relationship. The vendor limit is set by past experience. On the other hand,relationships come unstuck b'coz of one-two exceptions of poor performance and how the vendor responds to it. We do know level of effort into outsourcing is about the same irrespective of size of deal - mid size companies definitely are a big opportunity but bring with it the complexity of vendors having to deal with too many at one time. Finally, the killer is about promising too much in too little time- be it speed of ramp up, productivity, tools deployment, new process deployment. Quality is always compromised when time is short. So chances are most companies will do a poor job if they do not understand their own limitations and seek to grow at a pace beyond their capabiity. The demand for outsourcing is definitely starting to show rapid upward momentum. Initial momentum will spike through organizations loosening their purses and daring to spend and hence clear backlog. We are still a few months away before discretionary spend becomes mainstream. Larger contract sizes will again be a thing of the present. Continental Europe will seriously think on an offshore outsourcing strategy and will become more open like the UK. I believe that but for a few large organizations, they will take time to learn to get their expectations right before embarking on serious outsourcing activities. The service provider canvass definitely shows signs of changing. While you ask, “can vendors cope?”…there is no option and this will happen through consolidation, collaboration and focus. We will see a number of mergers and acquisitions more for scale and same-time-zone presence than only for market reach. Size will continue to matter. Partnership amongst service providers will be the need of the day. Many broad-spectrum IT and BPO services companies will now shed entropy and start concentrating on what they do best and build on these to augment delivery capabilities. Many will now mothball number of “like to have” service areas and vertical focuses for revival after a couple of years or three when the demand phase plateaus and monies have been made. Technologies like the cloud, web 2.0 etc do show promise but not for immediate surge in earnings. How many companies can have their private cloud? If public-cloud how many cloudbanks are available and how quickly companies can adapt to this computing paradigm to see results in measurable period in the immediate future? Way back in the late 1990s we said the next big thing to happen in the way we compute has already happened via Web services. Other than a few prominent examples, where have we seen this revolutionizing the computing landscape? What happened to the “central” UDDI servers? We still see number of organizations tentatively using dipstick tests for implementing SOA. SOA was touted as the Holy Grail for integrating all and any in an organization’s portfolio of applications! New technologies will take time for adaptation by the industry and though these will play a role in enhancing opportunities for the service vendors, it will be some time before they provide the “buck for the bang” and not the other way round! Taking a realistic view of what is happening now and what could happen soon, I see tremendous opportunities for some innovative deal structuring, addressing demanding payment terms and need for novel engagement models. I do not think the rates pressure will continue and on the contrary the rates for offshoring will increase and customers will be willing to pay. I will be surprised if rural sourcing does not take off big time in the US and a number of BPO style work delivered from these regions at lesser cost. This will result in more employment in the US. We will see more small and medium companies jumping into the outsourcing bandwagon but they cannot have the standard engagement model where organizations demand dedicated teams, core teams with ramp up and ramp down facilities etc. Engagement models like shared services and commercial models like pay for work quantum will start gaining momentum and become the norm. We could go on and on but then, one thing is certain, strategies employed during the boom times are not going to work as well anymore. A radical change in how we perceive and address; the market, the nature of our business and the imminent change in the demand pattern from the customers is mandatory if we have to buck the trends and emerge victorious. The next few years are going to be fun for the daring but kind of dismal for those who would want to play safe. I always felt the most important challenge a company faces when it tries to grow is growth. Most IT service vendors started as small companies where scalability was not an issue. Today when businesses are more dependent on them it it time for them to ramp up. I think two key factors would be to have the right team and also a global org culture. Many companies become localized and tend to staff from one country which can paralyze them in the long run.